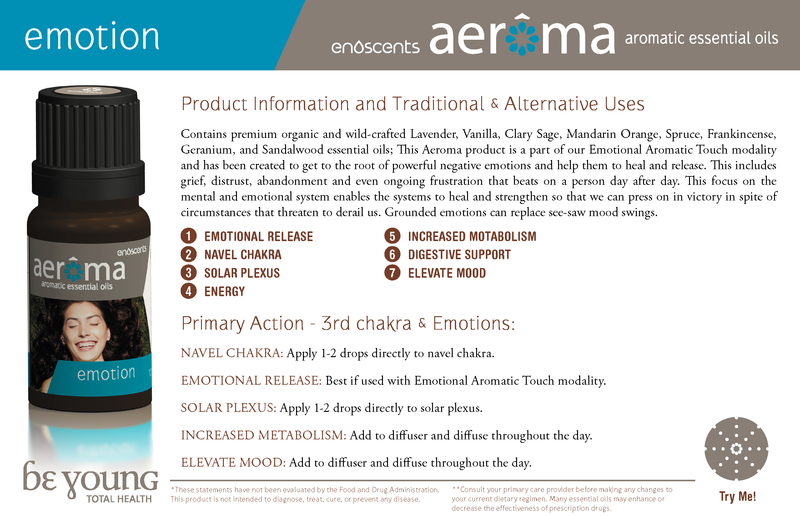 Emotion™ blend was specifically formulated for the Be Young exclusive program Emotional Aromatic Touch Modality™. The combination of essential oils included in this blend have a powerful balancing effect on the 3rd chakra (solar plexus). Specifically blended to balance and restore the body's natural ability to regulate energy pathways and emotions including feelings of anger, distrust, grief, or feelings of abandonment. Apply 2-3 drops directly on the solar plexus chakra. Use: Perfumery, flavours and food grade application. Apply 1 drops to the upper portion of the ear to help with stressful situations. Apply 10-15 drops to a diffuser to help with anger and aggression. Apply 1-3 drops to the back of the neck of your pet to help with aggression.